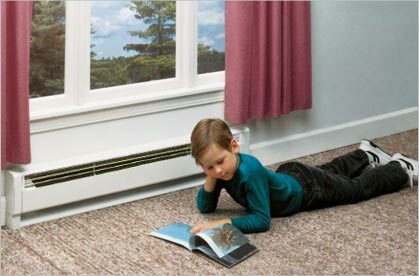 Electric baseboard heaters provide a convenient and economical way to heat your home. They can help counteract the loss of warmth from windows and are excellent for zonal heating since you can turn them on and off depending on which room you’re occupying. The compact, low-profile design of baseboard heaters permit them to remain conveniently out of the way. The broad, thin devices are usually wall mounted, although there are some portable free-standing options. With proper usage and routine cleaning, your electric baseboard heater should last for many years with few problems. 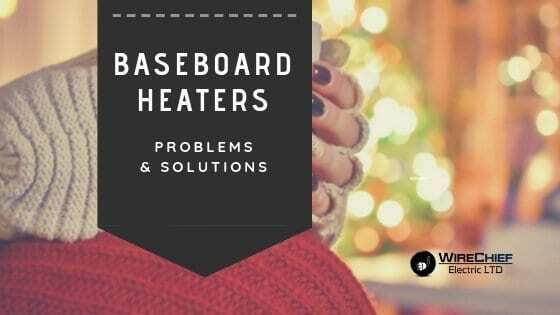 We’ve compiled a list of common problems people have with their baseboard heaters, and provide solutions to prevent any anxiety from settling in. Most solutions are easy enough, but if your electric baseboard heater is truly acting up and you don’t feel comfortable getting into the heart of the matter, call a professional electrician right away. Ensure you’re using the proper amount of power: Most rooms need 10 watts per square foot of space. So a 1500 watt heater can heat an area of 150 square feet. If your baseboard heater isn’t filling the whole room with heat, contemplate adding extra units. Also, confirm that your supply voltage isn’t less than the rating of the heater. Check the voltage of your heater and supply wires to double-check they match. Check up on insulation and keep the temperature up in unused rooms: It’s essential to have proper insulation in a home heated by baseboard heaters. Inadequate insulation makes baseboard heaters work harder and longer than they need to– canceling out any benefit and cost advantages they offer. Make certain doors and windows are all-weather stripped, and re-caulk where necessary. Make sure to clean your baseboard heater: Dust reduces a baseboard heater’s efficiency. Turn off the power and clean the front of your baseboard heater. The vents must be vacuumed once a year before the winter season. 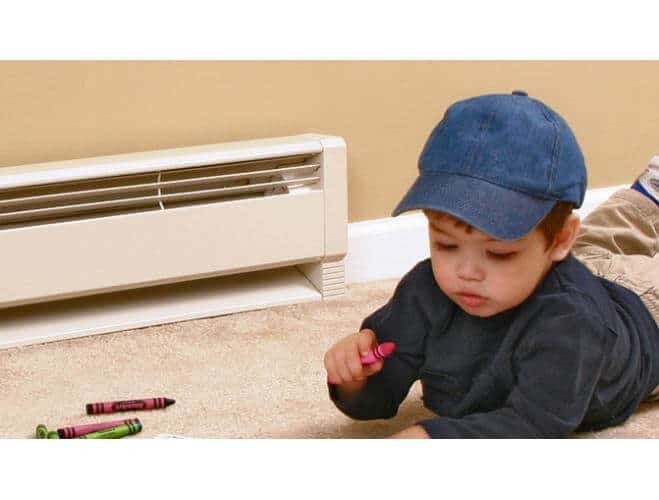 Open the baseboard heater louvers when you’re making use of them to help spread heat easier and keep them closed when you’re not, to prevent dust from building up. Don’t block the airflow: Baseboard heaters are a pretty safe heating source, as long as you don’t leave items too close to it. Baseboard heaters are made to sit ½ an inch above the floor or carpet to allow proper airflow throughout the system. Most units have a safety thermal cut-off feature to help prevent overheating. Don’t place furniture too close, and avoid having window drapes or blind cords covering the unit. Make sure smaller items, like children’s toys, aren’t left too close nearby. Buy a baseboard heater cover: A new baseboard heater will most likely come with a cover, but if you have an old heater you can easily renovate it to update its look and safety. Covers enclose the heated parts and help in childproofing your baseboard heaters. Use an automated thermostat: An automated thermostat allows you to maintain a constant atmosphere in the room. Once you set up your thermostat, the baseboard heater cycles on and off to maintain the temperature of the room steady and there’s a much lower chance your units will overheat. When purchasing baseboard heaters look at the features to see if they have safety measures like an automatic high-temperature shutoff, in case of accidental air blockage or tip-overs. Use an external thermostat: Many baseboard heaters come with a built-in thermostat, which isn’t always the best at maintaining a consistent temperature. If your baseboard heater output isn’t matching its setting, think about installing a wall mounted thermostat for your baseboard heater. Baseboard heaters must have their own thermostat, so you can’t connect them to a central heating system, but they should not be too expensive and can be well worth the extra investment. Vacuum out debris: Dust and debris can prevent electric baseboard heaters from performing at their best, so make sure your heater is well maintained and cleaned. It’s easy for the fans to get clogged over time since baseboard heaters work with a constant airflow. A unit will automatically turn off when it begins to overheat due to clogging. Also, make sure the thin metal fins of your baseboard heaters aren’t damaged or bent, which can impact heating efficiency. Ensure the wiring is correct: A malfunctioning heater might be the result of a small wiring error. If you think this may be the issue, carefully check your wiring. It may be wired at the wrong voltage so check the voltage of your baseboard heater and your supplying wires. If the voltage is correct, it could just be a shortage, so check for burn marks or other signs of damage. Contact the manufacturer: When baseboard heaters are freshly installed, they have an oily and smoky smell the first time you turn them on because of the residual lubricant remaining on the heating element from their manufacturing process. Be sure that your room is well-vented, and wait around 30 minutes for the smell to go away. If it still lingers, contact the manufacturer to see if they have any suggestions on what you can do. Check on the power and the wiring: First check the circuit breaker to make sure it isn’t the problem. If the breaker starts off cool to the touch and then turns hot just before it trips, there’s probably a loose wire connection somewhere. If the breaker trips just after turning the circuit breaker on but before turning the heater’s thermostat on, then there’s an electrical short between the circuit breaker and the thermostat. Check the wires from the circuit breaker to the baseboard thermostat and look for wire burn marks, frayed areas, and other signs of damage. Check the thermostat for signs of burning as well. If the circuit breaker stays on but the heater doesn’t warm up, the problem is the thermostat, the heating element or the limit switch. You can check each individual wire for a short with a multi-meter. 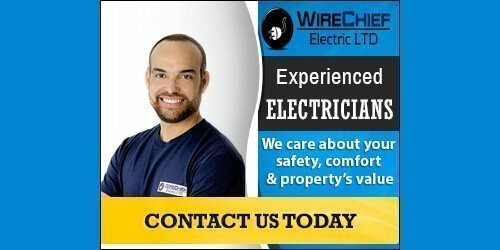 Call a professional electrician: Wiring can be very dangerous, so if you suspect something is wrong, the best and safest thing to do is to call a professional electrician to come to check it out. 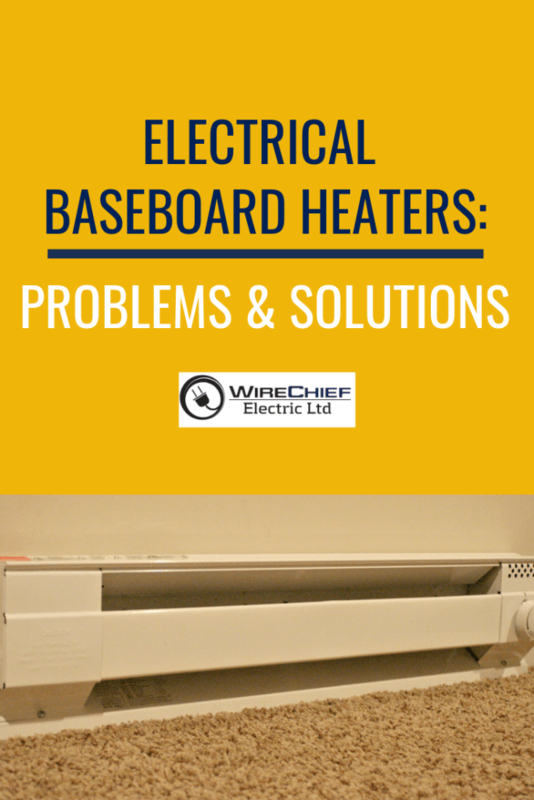 Calling someone who knows what they are doing is the quickest, easiest and safest way to troubleshoot your electric baseboard heaters. If you properly maintain your baseboard heaters regularly and use them correctly, they should deliver consistent, efficient heat for decades before ever needing to be replaced.